Hi, I am interested in your 1982 Chevrolet Corvette Coupe (stock #4659-ATL) listed on Autotrader for $21,995. I'd like to get more information about this vehicle and confirm its availability. As everyone knows, 1982 was the end of C3 Corvette production, but GM definitely sent it off with a bang. 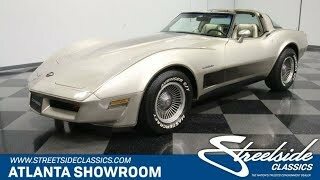 They built 6,759 Collector Edition coupes like this nicely preserved original, which today are a nice piece of any collection of fiberglass and still a great way to enjoy a vintage Vette on a budget. In their usual unexciting way, GM called the finish on the special edition Corvette Silver Beige which, I suppose, accurately describes the pewter-like hue. Not quite silver and not quite gold, its one of those instantly-recognizable cars that youll see far away at a car show and smile to yourself because its so iconic. This one appears to be largely original, including the paint, which shows a few signs of age here and there, but overall looks like it rolled through the decades without major incident. Fit and finish are actually quite good, dispelling the myth that these cars were poorly made, and the darker graphics on the lower doors and hood define some of the Corvettes most dramatic features. The hatchback profile, deep chin spoiler, and ducktail end cap all add to the distinctive look that was uniquely Corvette. The subtle but well-executed interior is tastefully done, particularly for the era. Original seat covers on the adjustable buckets look good and these chairs really are as comfortable and supportive as they look. Door panels with multiple shades of silver beige give it a racy look without being too loud about it and the neutral carpet makes it bright inside without being a pain to keep clean, although this one could really benefit from a dee detail. In all, its a very well-designed interior that suits GMs flagship just fine. The carpets are in great shape, the dash hasnt been baked by the sun and cracked-up, and the door panels and center console present very well. Sure, the steering wheel shows some white-knuckle impact points, but the gauges show crisp markings, and its loaded with options like A/C, power windows, locks, seats, and mirrors, a tilt column, rear defrost, and just about anything else GM could invent to include in the top-of-the-line Corvette. Glass T-tops mean that there was still an open-air experience with the Corvette, and they seal up well. For entertainment, theres also an AM/FM stereo in the center stack that sounds great. The only engine in 1982 was the Cross Fire Injected 350 cubic inch V8, which was torquey, powerful, and surprisingly efficient thanks to a new 4-speed automatic overdrive transmission as standard equipment. Considering how easy these are to modify and how many Cross Fire cars have received carburetors over the years, its nice to see one thats almost completely stock under the hood, not to mention still numbers matching. The offset air cleaner gives it away, but youll be impressed by how clean everything is and how well-maintained all the vitals are. It starts quickly and easily, idles well, and snaps through the gears with authority, making for an entertaining V8 drive. The undercarriage is mostly original, again with proper maintenance along the way. Correct turbine alloys were standard on the Collectors Edition, with this one carrying Mastercraft Avenger G/T white letter radials at all four corners. This is a distinctive, fun-to-drive Corvette thats extremely affordable, and with a numbers matching engine and 53,375 original miles, its sure to keep rising in value. Maybe GM got it right calling it a Collectors Edition, because we never seem to be able to keep them in stock. Call today!